A woman touches a man on the shoulder as he stands facing away from her. Man: In Paris you said you would never ever leave me. The man and the woman are seen standing facing each other and engaged in conversation. 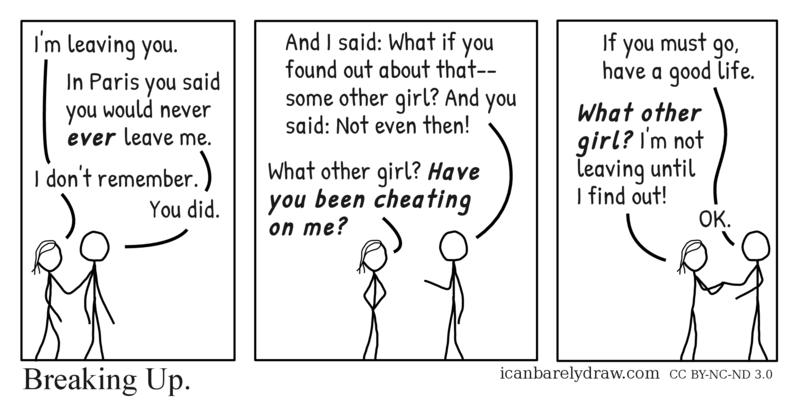 Man: And I said: What if you found out about that-- some other girl? And you said: Not even then! Woman: What other girl? Have you been cheating on me? The woman is now holding the man's hand with both her hands. Man: If you must go, have a good life. Woman: What other girl? I'm not leaving until I find out!